In a highly competitive world, merely keeping up with others isn’t enough to stay at the top; you’ve got to get out ahead. Premium brands aren’t just going with the flow. They’re directing it. One of the most impactful ways brands can promote their premium look and feel is through innovative marketing and sales techniques. When looking at a brand like Apple, it is easy to see how they have managed to set themselves apart through innovative branding in addition to their innovative products. How Can Premium Brands Create Effective Innovative Marketing and Sales Techniques? One of the hot trends over the past few years has been the pop-up shop: a temporary store or experience that is placed in an audience targeted area to build brand awareness or hype up a product. Pop-up shops have helped to push brands because they are cool, attention grabbing, provide a unique experience and can show up where a regular store can’t. That sounds great, but what about a more permanent solution? Premium Vending Machines have been making headway and are poised to be the next big thing in consumer marketing. Now is the time for premium brands to jump on this trend to get full and lasting exposure. Premium vending machines are completely custom and allow brands to create versatile, specific and unique sales experiences that can enhance the image of their brand. Custom vending machines have all the benefits of pop-up shops but add complete customization and are able to showcase and enhance the style, feel and voice of a brand. 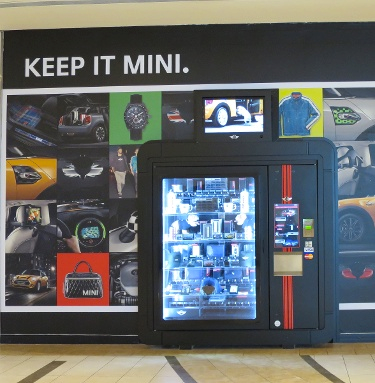 Unlike temporary pop-up shops, these vending machines have the benefit of being a permanent solution to enhancing your brand’s reputation. vending machines to showcase prestige products. Building shops and hiring sales staff is an expensive and time-consuming process, especially in premium locations. With premium custom vending machines, brands can position themselves in high-priority locations for a fraction of the cost of a full-scale store. This means their profit margins go up and their ability to expand to more premium locations increases. The sales staff of a premium brand have long been a part of a premium experience. They are also a potential liability. As a premium brand grows to multiple locations, so does the likelihood of new hires not reflecting the brand’s integrity. This is an especially large risk for pop-up shops, where staff are only on-site for a few months or less. With a premium custom vending machine, products are delivered consistently and in-line with brand reputation, removing the risk and cost of new or temporary staff. Premium vending machines are so new that they generate immediate buzz and create an elite and exclusive feel. They are in the perfect position of being new enough that they are exciting, while having been tested enough to prove their effectiveness. The small space that a custom vending machine takes up makes it possible to focus on highly specific areas of business. A brand can promote a specific product or line of products in a targeted area to maximize effectiveness. A jewelry store, for example, positioned in an airport could have a vending machine that only sells gifts (for those who forgot to get gifts on their travels). The days of vending machines being seen as simple purveyors of snacks are behind us. In today’s world, premium vending machines are transcending the traditional retail experience, offering audiences new, exciting and convenient ways to become part of your brand. Contact us today to see how our premium machines can enhance your premium brand.